Singers Nick Lachey, Drew Lachey, Justin Jeffre and Jeff Timmons of 98 Degrees perform at the Air Canada Centre in Toronto in 2013. This week, we’re exploring data from The Echo Nest and Song Meanings about 1990s boy bands. Check out our explainer of how the data set works here. 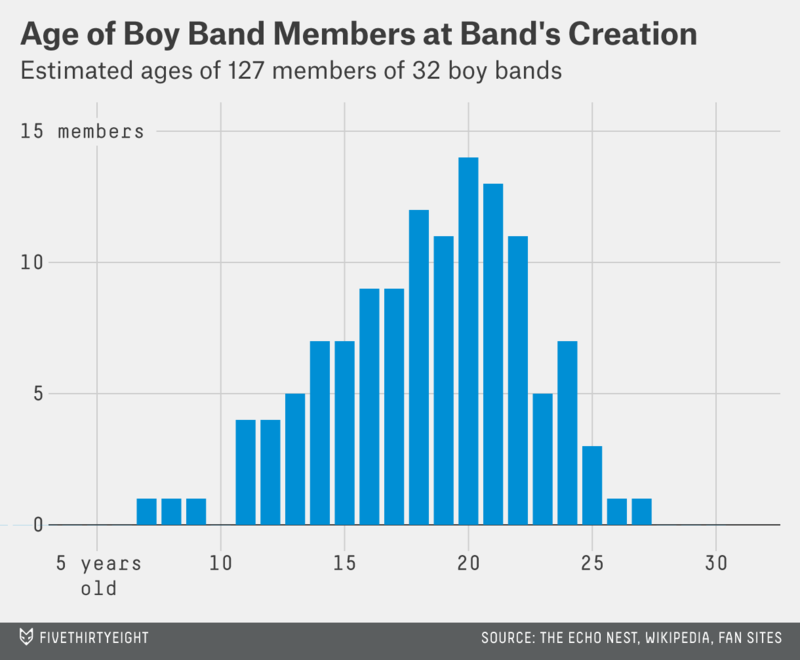 Earlier, we looked at boy bands’ composition and lifespan. This installment looks at the laughably old ages of their members. Yet that’s exactly what we do. Among 1990s boy bands, the average member at the group’s founding was about the age of a college sophomore. I was able to locate the birth years of 127 founding members of 32 of the 36 ’90s boy bands from our set. Admittedly, most of them were derived from English- or local-language Wikipedia pages, so the results should be considered with the standard dose of skepticism. I then estimated the age of each boy band member at his group’s creation by subtracting his reported year of birth from the band’s reported founding year, according to The Echo Nest’s data. Although it’s an imperfect estimation, errors can be expected to cancel out in the aggregate, assuming birthdays and exact founding dates are random. The median age for a member of a boy band at founding was 19. The band with the youngest median age at founding was Hanson, which started when the brothers were 7, 9 and 12. The boy band with the oldest median age at founding was 98 degrees: 24 years old, an age at which nobody has any right to call a performer a boy. And this is only the age at founding. Some of these boy bands are technically still around. As I said in my earlier boy band piece, one of the *NSync members is balding! Imagine what the dudes from One Direction will look like in 15 years. Why does this matter? As I’ll get to later in this series, it can seem weird that a team of college sophomores are specifically targeting preteens with substantially sexed-up songs. I’m not trying to pull off one of those ludicrous “we need to protect our children” crusades, but no matter how we slice it: Isn’t it slightly off-putting that this has become, for a significant number of artists, a reproducible business model?